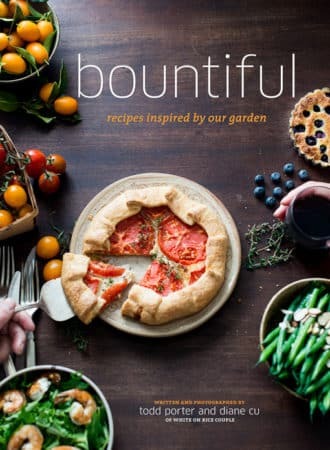 Spring Fling is here and were celebrating Spring’s bounty with Deb, Editor of Food Network, Margaret of Away to Garden, Jaden Hair of Steamy Kitchen. This week’s theme is rhubarb and to participate, just share your rhubarb recipe link in our blog on the comments below, as well as the blogs of all our participating friends! The world needs more rhubarb dishes. It’s fun to say. You can freak people out by telling them the leaves are poisonous. It looks like a funky red celery stalk. It magically transforms when cooked from firm and crispy to melting-ly soft and it has an amazing sweet-tart tang. Here in Southern California, it seems like we hardly ever see anyone using rhubarb. You’ll find the few tired stalks in the grocery produce section, and the better farmers’ markets will always have a farmer or two with their freshly hacked red canes, but I can’t remember the last time I saw rhubarb on a restaurant dessert list or in a bakery’s selection. Maybe we just aren’t hitting the right places. Maybe it is a good thing we don’t get spoiled with regular rhubarb delights. It’s kind of nice having an ingredient remind us of our innocent years. It takes me back to the house of one of Dad’s cutting horse buddies (who was also our Jr. High P.E. teacher) and the evenings spent there where us kids tried to play pool while the adults gabbed about boring adult stuff, and all summer long there was almost always a rhubarb pie perched on the counter top. Regular Norman Rockwell times. In preparing for this dish, I was determined to avoid the cliche of the rhubarb-strawberry pairing. “Sure they are fantastic together, but it’s… too cliche,” I kept protesting in my head. However one of our photo gigs this past week was to shoot a local strawberry farm for Whole Foods, and the berries were sooooo good. So Cal rocks the strawberry fields, and when they are in season, it is hard to get them out of your head. My no-strawberry will power lasted until literally a hour before I had time to make the crumb bars to shoot. But that last trip to the market to get eggs gave me just enough of an excuse to deviate over to a nearby farmer’s stand and get a 3-pack of juicy, sweet gorgeous strawberries. 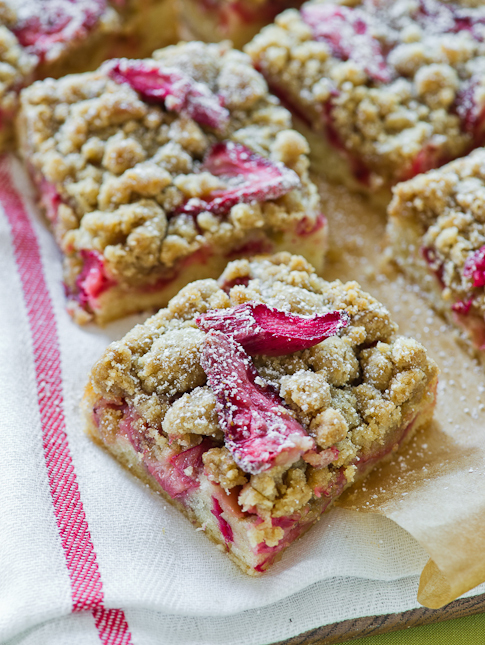 So this bar recipe is now a Strawberry-Rhubarb Crumb Bar recipe. If you have more will power than I, just double the rhubarb and leave out the strawberries. You can always save the pardoned strawberries for Strawberry Mojitos. These bars are rhubarb rock stars. The base batter bakes into a wonderful soft, moist cake. The next layer is the sweet-tart dynamic duo of the strawberries and rhubarb which have baked down to a tender tang. Then everything is finished off with a brown sugar streusel topping. 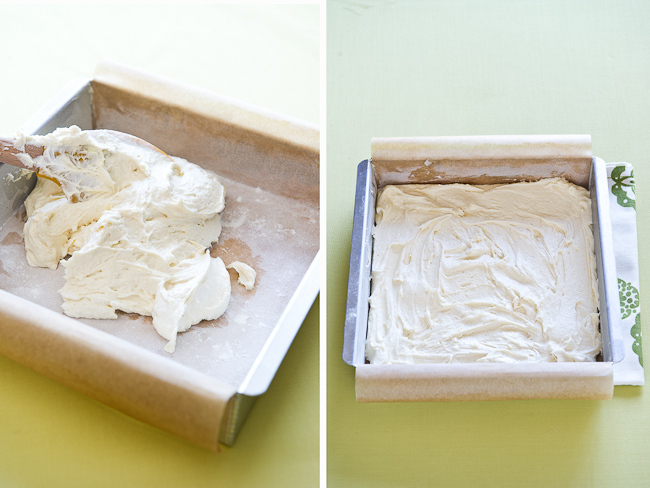 If you really want to go crazy, whip up a batch of fresh whipped cream and top the bars with a little heaven. Mamma. add big dollop of whipped cream to celebrate rhubarb! 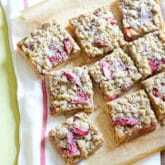 Adapted from Martha Stewart's rhubarb crumb bar recipe. If you want pure 'barb, just double the amount in the recipe, and leave out the strawberries. Preheat oven to 350° F. Line a 9" square baking pan with parchment paper, leaving a 2" overhang on two sides (use a swipe of butter on edges of pan to help keep parchment flush with pan. Butter and flour parchment and pan, tapping out excess flour. Whisk together butter, brown sugar, and salt. Add flour and mix together using a fork or your fingers to create large crumbs. Refrigerate until ready to use. 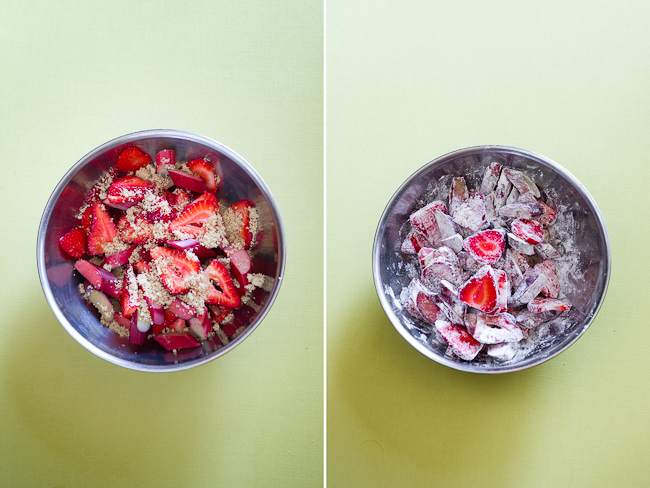 In a medium bowl, combine rhubarb, strawberries, brown sugar, and 1/3 c (50g) of flour. Sift or whisk together remaining flour, baking powder, and salt, then set aside. In a mixer, beat butter and confectioners' sugar until light and fluffy. Slowly add eggs and vanilla extract. Stir in flour mix until just incorporated. 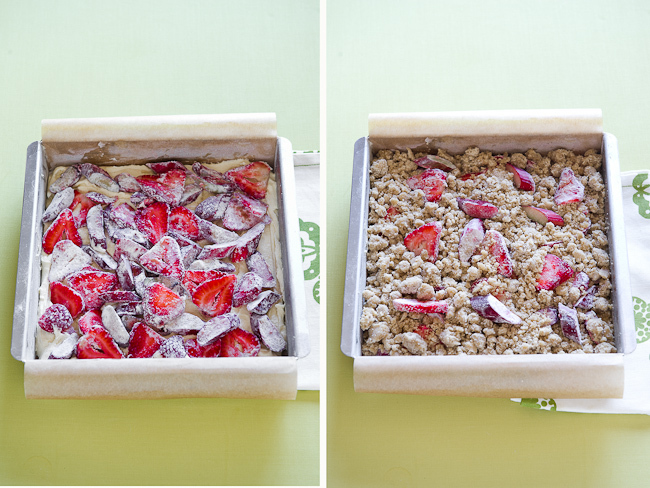 Spread batter in prepared pan, top with rhubarb/strawberry mix then top with streusel topping. Bake 50-55 minutes or until golden and a toothpick comes out clean. Let cool in pan, then remove from pan using the overhanging parchment tabs. While bars bake, whisk together whipped cream, confectioners' sugar, and vanilla extract to firm peaks. Set aside in refrigerator until ready to serve. Slice bars to preferred size, dust with confectioners' sugar and serve or top with whipped cream and serve. These look great! I’m baking them this weekend, just one question: about how long would these last in an airtight container in the fridge? For best taste and texture I’d say 2-3 days. I just made this and have one question: how will a toothpick come out clean if it has to pass through the layer of soft rhubarb? My cake SEEMS done, but I feel like there’s no way to test it with that method and rely on it. Try to pick a spot where you don’t have a big rhubarb chunk you are sending the toothpick through. The next key is in being able to differentiate between rhubarb cling and uncooked dough cling. Just like if you are cooking say a banana bread with chocolate chips. Sometimes you’ll hit a chip and it sullies your toothpick, but that will look different than if the dough isn’t all the way cooked and it clings to your toothpick. It may also take a few stabs to find a good spot. Hope that helps and that your initial bars came out in good shape. I made these for a potluck I went to last night and they were out of control amazing! A complete hit! That was a fantastic recipe! Mine turned out more like a coffee cake and was the tastiest the day after. Yum! As always, this is an amazing photo. Your site is full of eye candy and a pleasure to read! 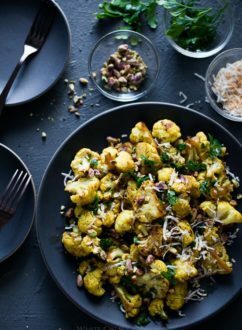 Your recipes and pictures are so beautiful! Congratulations! Another wonderful recipe of yours that I will have to try. I love rhubarb. Last year the farmer I buy most of my greens from told me about one of his customers buying chard for the first time. A red stemmed chard called rhubarb chard. And the customer made pie with it, telling the farmer it was wonderful because it wasn’t like the tart rhubarb his mother used. Makes me smile every time I see both rhubarb and chard. 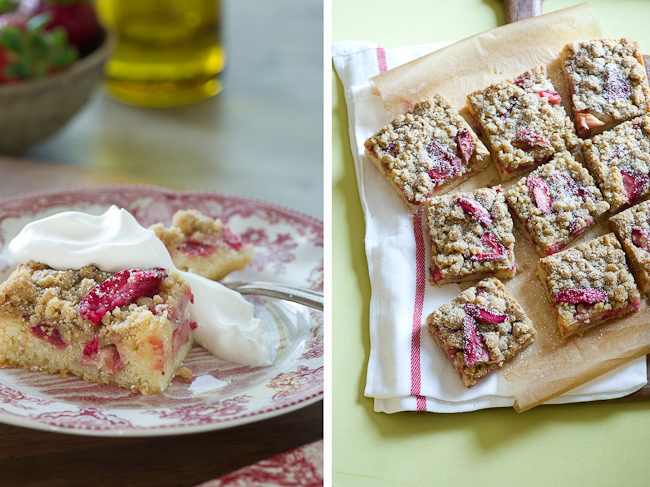 If you didn’t like rhubarb before, this recipe would be sure to change your mind! Oh, they were perfect. I agree that the strawberry rhubarb combination is overrated, but I’m glad I mixed them together this time!!! You two are such a power couple! 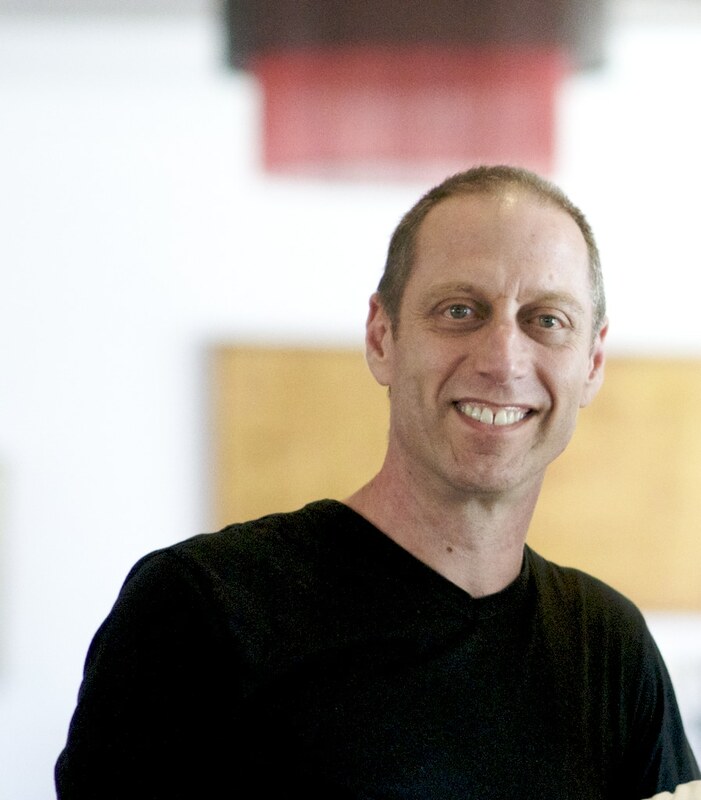 My husband is a filmmaker in LA as well while I’m an interior designer and wedding planner and with our powers combined we hope to do something as high-quality and passionate as you do! Amazing site, photos, and passion. Your rhubarb stalks look incredibly red-pink and juicy. I love love love this recipe and am going to have to make it the first rhubarb recipe I try this season. It’s just beautiful. Thanks again for sharing your lovely photos and stories. Your photos are mouthwatering! I live in the Bay Area and have enjoyed Rhubarb since growing up here. My Mom would cook it it in sugar and a touch of water and we would eat it warm in a small bowl. Quite a treat! Wonder why the scarcity in So Cal? These bars look and sound absolutely amazing. I need to make these very soon. I was looking for something a little different to make with my rhubarb! Yum. Thanks for sharing. Beautiful photos too! Oh, my, I wish I could send you all a big bunch of rhubarb, as I have 4 clumps of it growing just about 10 feet from my back door, and it is definitely ready to use right now!! I can see a lovely crumble in my immediate future. Thanks for the great recipe and the fab photos. Iowa has lots of rhubarb, but I had to import what I have from Minnesota, when we moved. So glad I did, because I love to share it!! 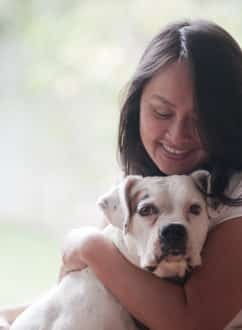 I’m new to your blog, but definitely hooked. Your photography is breathtaking. Omg found your blog via Katie Elliot and I’m in heaven. I absolutely love rhubarb and as someone who lives in LA now too no one eats it or serves it here. Growing up in CT, my grandparents grew it every year. We made jam, pies, and bars all the time. I always loved the tart and sweet taste. I made a cobbler last year for a dinner part and there was none left at the end of the night. I am solo making this and also some of the other ones posted. Spring Fling indeed! I’d love to join the fun…what is on the menu after rhubarb? Those look beautiful and so full of that coffee cake crumb topping that is simple butter/sugar heaven. I made this recipe for my Mom for Mother’s Day and she loved it! I just made a version of rhubarb bars that are modeled after lemon bars. Curd on shortbread – amazing! This is a recipe that I really have to try. I usually make jam with rhubarb or just a simple vanilla cake with rhubarb in it. 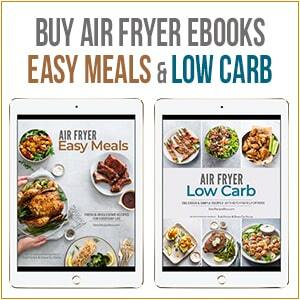 Nice to see all the recipes from your readers. I have a food photo to share, without the recipe this time. Its a sweet rhubarb strawberry compote topping a vanilla sundae. This gives mea FANTASTIC idea — Rhubarb Strawberry Empanadas. Wish us luck! YUM! As always your photos are so inspisring! Gorgeous photo, nicer than Martha’s(!). My husband’s a big rhubarb fan, and my parents grow it, but I’ve never been tempted until seeing these bars. Great tip about the beet! Rhubarb is on every second dessert menu in Montreal restaurants. We love it up here. I also love that at neighbor lets me raid his patch every spring. Although your bars are calling my name. Love the step by step photos! 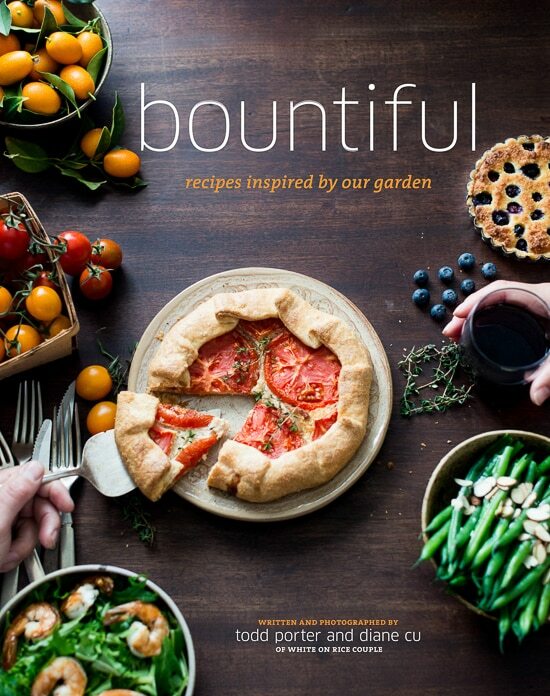 What a lovely recipe—I can’t wait to make it! Lovely photos! I really enjoy looking at your blog. I am seeing Rhubarb all over the place lately and it makes me smile! 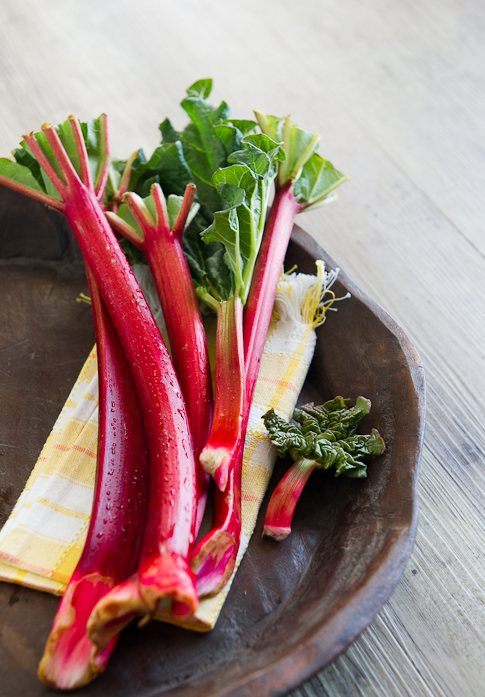 Rhubarb reminds me so much of Spring…and I am sure happy that Spring is finally here! These crumb bars sound fantastic and I can not wait to try them. Stunning photography as always! love it! I just bought my first rhubarb ever at the store last week and made a crumble with it—so delicious. Can’t wait to try your recipe next! My husband grew up with a bowl of stewed rhubarb sitting on the dinner table every night during rhubarb season. So, to say that we are rhubarb fans and that these bars look fantastic would be an understatement. Lovely! I live in Los Angeles now, but was raised in Minnesota. I have fond memories of eating rhubarb stalks straight from the ground. Kids loved it that way! So what is your most reliable source in LA for rhubarb? I’ve only found it once at Whole Foods, and sorry stalks they were! You’d think they’d at least carry it frozen, but no. I’ve had no luck at farmer’s markets, either. Can you recommend any places (in LA) that are carrying it right now? I’m dying to make these crumb bars! Leah- we’ve seen them often at the Santa Monica’s farmers market on Wednesday. And we’ve been fortunate to find them at Whole Foods and other local markets as well. Maybe they were just sold out when you were there. Try again! good luck! 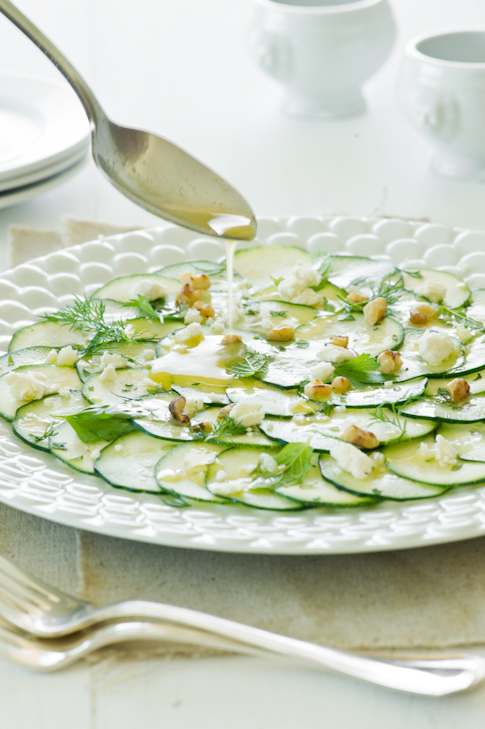 This is a perfect spring/summer recipe! These sound fantastic and your photos are gorgeous as usual! Hi Todd and Diane: It must be rhubarb and strawberry week! I posted a recipe on strawberry rhubarb crisp over the weekend. It was delicious. These look wonderful and would be fun to bring to work for a Friday afternoon snack with friends. You always make everything look so pretty and tasty. I wish we could grow rhubarb here, but it gets too hot and humid. This is just beautiful! I couldn’t resist the fresh local berries either – they’re just too good right now! I was in Vegas over the weekend and had rhubarb for the first time (it really is hard to find in Orange County) when I had dinner at Bouchon. They made a salad with heart of palm, rhubarb and cipollini onions. I can’t wait to try and recreate it. I just have to go to Whole Foods to get the rhubarb. I have rhubarbs on the counter waiting for me! 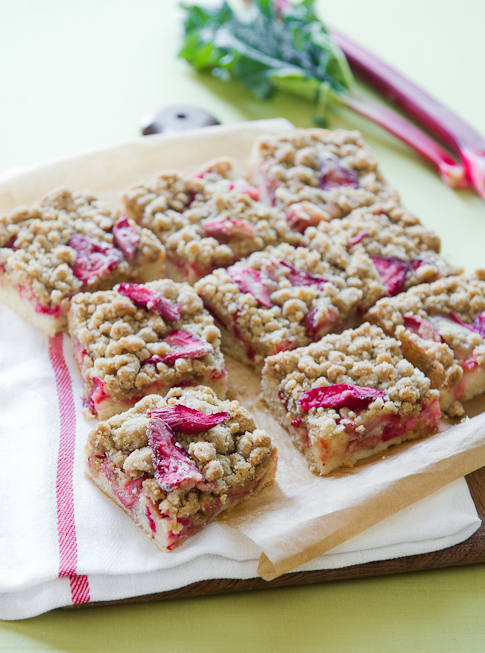 This crumb bar could be the ticket! Sounds weird and delicious at the same time. I will try it! Your photographs make me swoon and I only wish I could reach out for a few of those bars. Such pretty looking bars and looks very light and fluffy .. perfect for Spring !! I made a strawberry rhubarb crisp last night for a neighborhood gathering that was rained out immediately with everyone leaving right away, but not before getting a serving of their dessert. ummmm yes please! 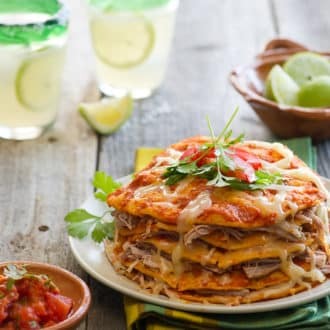 These looks so delish. And that batter looks so light and perfect. Plus crumbles are totally my thing – I would eat just the plain crumble by the handful! These look fantastic! My rhubarb and strawberries are just starting to grow, by the end of the month I will be cooking with rhubarb and we can’t wait. We never seem to tire of rhubarb, although I freeze some, there is never that much to freeze and we can only pick from the end of May until the real heat of July so we always look forward to rhubarb season again. I have a rhubarb patch that grows in size each year. Someday it is going to be so big that I will have to give it away. That will be the day! Rhubarb possibilities are endless! Well goodness don’t these just look like heaven on a plate? So lovely! Gorgeous! I’ve never seen rhubarb on any menu, anywhere – to eat it, you have to make it at home. I think that’s what makes it one of those “magical” foods. These are just amazing looking. I LOVE crumbles of any kind. 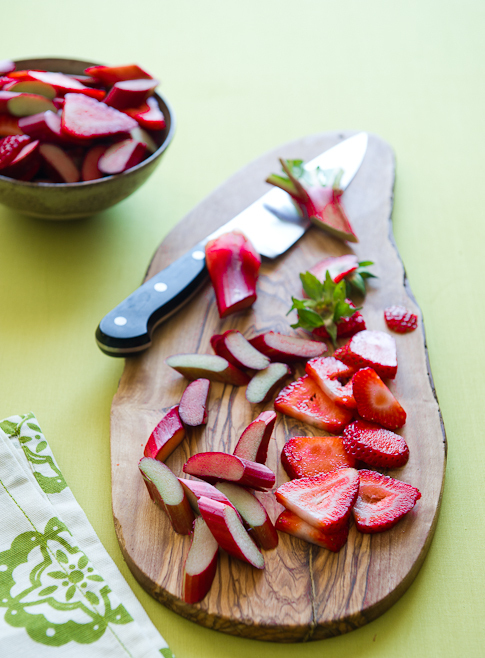 Rhubarb + strawberry sounds divine. Thanks for the links to the other rhubard bloggin’ people, too! I so wish we could get our hands on Elderflower in Southern California. We recently discovered a little visual trick when poaching rhubarb… add a slice of beet to the liquid to give the ‘barb an extra little pop of red. Stunningly beautiful. The savory rhubarb chops sound fantastic! These look gorgeous! I made a simple strawberry crumb last night to use up some leftover strawberries and it was awesome, but I didn’t make a bottom layer. YUM! Thanks! The easiest substitutes would be strawberries or really, most any other berry. But it would be fairly easy to make the crumb with apples, peaches, plums… You might have to tweak the recipe to adjust for the different juiciness levels and how the fruit bakes. Good luck!